Yuzu-----------------------------! I confess I could not watch live today although I was at home. I had no courage. But you are much more man that I thought. I have been his fan since Sochi, and watched him, his statements, his attitudes... But still I underestimated him. I cannot fully say how his performance has given me a lot. I still cannot believe. He is a gift from heaven. He won the heart of all. Yuzu, I shall keep supporting! You are the best. 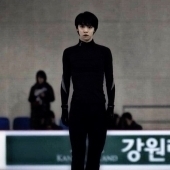 My heart is about to break... GOOOOOO, yuzu!!!! Believe in yourself. You have come so long, and the experience which you have achieved shall never betray you. You are in the different level. Happy new year, everyone! I wish you all the best! 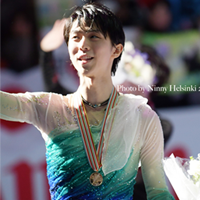 Yes, I believe in yuzu's strength. He shall come back stronger! OMG! The time has come! So glad to hear Liza's entry. Ive heard she got pneumonia. Since I was in GS, i really love to read birthday messages by fans. It is filled with love, sincerity and positive aura. A joy of once a year (sorry, I dont have time to put "good" to everyone, but all are good!). I cannot help but pray happiness for your fans also. The same with you... I knew it, but feel so sad to think about him... How hard for him... I have no words. But I thought judges would give Medvedeva 70 or more automatically, so im surprised. What makes me get surprised is Medvedeva's PCS. Is it the first time since her first senior year? Yees. Finally Mai comes!!! Im a bit bored with her same type of styles, but definitely she deserves it. Yeah... Poor her. And her body shape is changing. Challenging new areas seems so hard for her. Tango is not hers... Heartbreaking..
Tell me please. 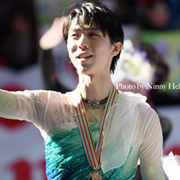 Who is qualified for GPF?